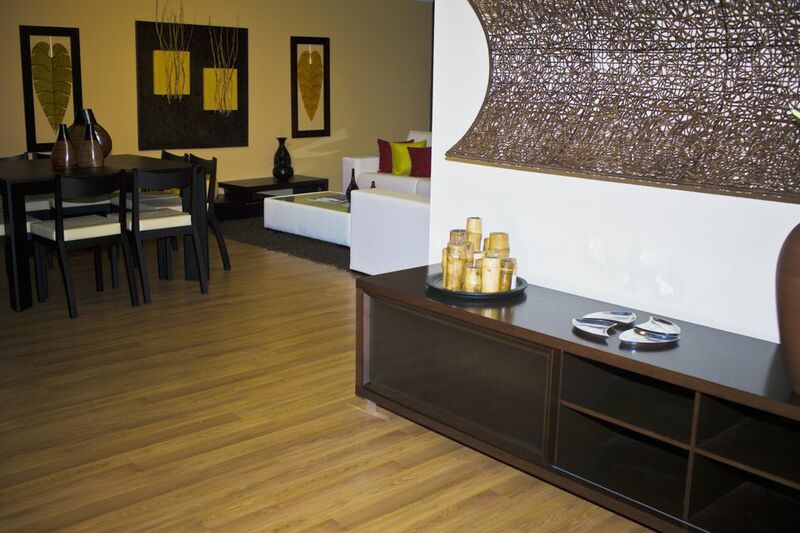 Bamboo flooring is considered one of the more eco-friendly flooring products on the market. It is thought of as "green" because, unlike hardwood, it is a grass that quickly grows back. Due to its grasslike-properties, bamboo flooring isn't just milled out of logs and formed into solid slabs. It is a conglomeration of many strands of this grass that are combined with resins and formed under high pressure into boards, and made into many types of flooring. And it is this alignment of different strands that brings us to the issue of horizontal vs. vertical bamboo flooring. Aesthetically, this is the bamboo floor that looks like bamboo floor. Strands are formed into sections, and these sections are laid horizontally. This produces the distinctive "knuckle" effect that lets you know this is bamboo. Except for those knuckles, the pattern of horizontal bamboo floor is relatively clear and uncomplicated. Bamboo stalks are laid in a vertical fashion and adhered together. Think of a row of 2x4s laid on end and pushed together, and you'll get a good visual sense of vertical bamboo floor. Its appearance could not be more different from that of horizontal bamboo floor. Because more edges and seams are visible, its outward appearance has a more textured, "busy" look. It's all about which look you prefer. From a functional standpoint, there isn't much difference. The standard for measuring wood flooring hardness, the Janka test, produces ratings that are roughly the same between the two. Prices for both hover in the same region, too, no more than $0.20 between each version. It basically comes down to a style choice.